“Please enter a valid email address” – are you getting this error while trying to create new Facebook account? This happens when there is problem with email ID (according to Facebook terms and conditions) being provided by you at the sign-up webpage. Since Facebook is for personal use, email IDs that resemble businesses or organizations are termed invalid and cannot be used to sign up for new Facebook account. Facebook does not support email IDs typically used for organizations and businesses. If you are using email addresses with generic prefixes (e.g. info@, webmaster@ etc.) – you will get email address not valid error and Facebook sign-up for new account will not complete. 1. Since Facebook is primarily for personal usage, it does not allow email IDs used for businesses to sign up for personal Facebook account. However, if you want to use Facebook to promote your business, product or company – then you can checkot the option to create fanpage on Facebook for your business organization for promotion. 2. To fix this error, you need to provide a personal email address to complete sign-up for new Facebook account. Instead of using webmaster or info – use email ID with your name or words that are not generally used for business or organization’s email IDs. 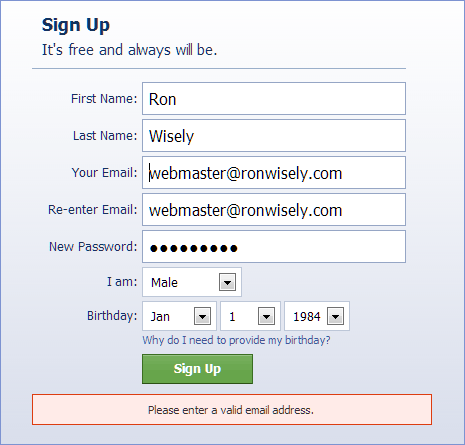 For example: As seen above webmaster@ronwisely.com is rejected by Facebook as invalid email address. You may use ron@ronwisely.com or ronwisely@gmail.com and so on. This is a strict Facebook policy with no exception to prevent use of business email addresses for creating personal Facebook account. So check email ID you are providing at sign-up page to fix this issue.